This is an exciting time of year for cooks; a time when so many special fruits and vegetables come into season for just a brief and tantalising spell. As with rhubarb and wild garlic, we are making the most of English asparagus and it features on our menus on almost a daily basis. Generally I tend not to do too much to asparagus. I simply steam it and serve with a squeeze of lemon and melted butter or a soft poached egg. Our girls go crazy for it, especially when they can eat it with their fingers. 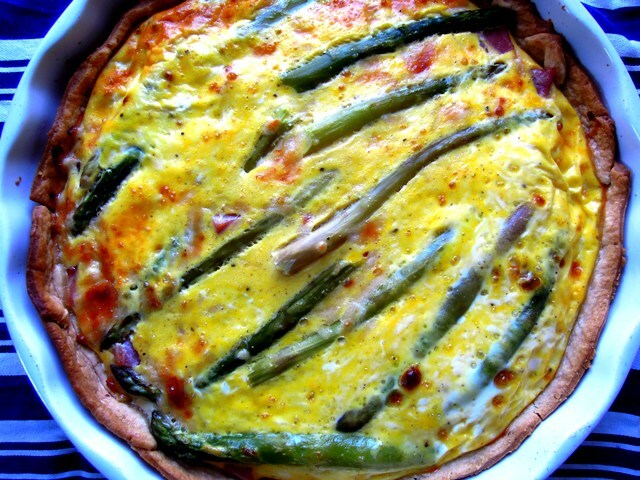 But I do also enjoy asparagus in a simple tart, like this one, with ham and Parmesan. It’s incredibly easy to make, especially if you forget about making your own shortcrust pastry and buy in ready-made instead, and it’s just as good eaten cold the following day. Lightly flour your work surface and roll out the pastry to line 9 inch well-buttered flan dish. Line the pastry with foil or baking paper and fill with baking beads or rice. Bake in the oven for about 10 minutes until the pastry just starts to turn golden. Remove the beads or rice and the foil, and brush the pastry with a little of the egg you’ll be using in the filling. Return to the oven for another 5 minutes so the egg seals the case. Allow to cool slightly while you prepare the filling. Lightly steam or boil the asparagus until only just cooked; it should still have a little bite. Refresh in ice cold water to stop further cooking and to retain that beautiful green colour. Drain well. Gently beat the eggs and the extra yolks (which give it that lovely vibrant yellow colour) and combine with the yoghurt, milk and Parmesan cheese. Season with salt and pepper. 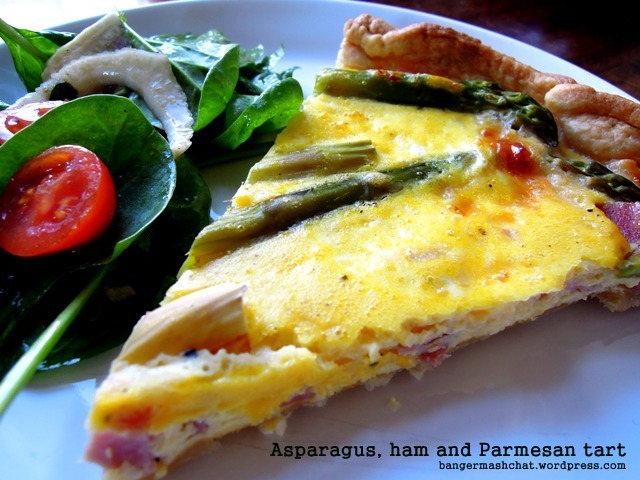 Arrange the chopped ham and asparagus in the pastry case and pour over the cheesy egg mixture. Bake in the oven for 15 to 20 minutes until the filling is set and golden. Leave to cool a little and serve at room temperature with a simple salad. As this is such a seasonal tart, I’m entering it into Ren Behan’s Simple and in Season blog event, which this month celebrates its second anniversary. You’ll discover lots of tasty recipes over there using asparagus as well as the likes of rhubarb and wild garlic. Oh delicious! I’m loving the asparagus season too, though I can’t get my kids to try it?? Keep on trying but they look at it with fear! Really. Strange. 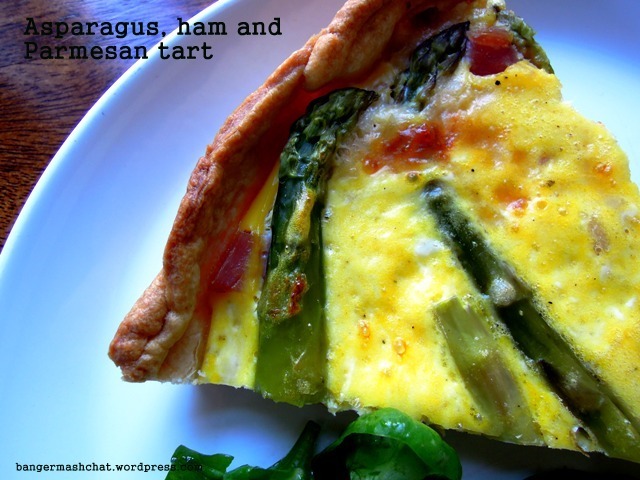 Might have to add some ham to the next asparagus tart I make (think I’ve made four so far this season! ), would be a very worth addition. Thanks Louisa. Ham and asparagus are a great combination in my eyes. I think I must be very fortunate with my kids as they both adore asparagus. It’s possibly partly down to the fact that my husband and I get so stupidly excited whenever we get to eat asparagus, they get swept along with it all and assume it’s on a par with chocolate! Looks lovely. I can’t get enough of asparagus at the moment too. Have just planted some seeds on my windowsill as the local lady asparagus grower at the farmshop just down the hill from me tells me they germinate & grow easily. I have a long wait though so very grateful for her lovely freshly picked asparagus in the meantime. I do have lots of home-made/reared air-dried ham that I reckon would be great in this though. Thanks Andrea. I can’t wait to eat homegrown asparagus. It’s definitely a case of good things coming to those who wait though, isn’t it? We planted crowns last year and I think we’ll be waiting until at least next year before we can harvest anything. I love the sound of your homemade ham! Gorgeous looking tart and lovely colours. Using Greek yoghurt in a tart filling is a new one on me. Definitely one to try.